* Mary Jo Albright's Sketch Challenge in celebration of reaching 60,000 hits on her blog, Beauty Lies Within. You can see the sketch HERE. * Sharon Johnnson's Stamp Simply Challenge #15 on her blog, No Time To Stamp. The challenge was to simply use something NEW. Easily done since I had just received my preview brochure order right before Christmas. This is the first chance I've had to play with my new rubber! This adorable mouse and heart image is from the new stamp set, Happy Heart Day (found on pg. 65 of the NEW '08 Spring-Summer Idea Book & Catalog .. U.S.). The mouse and heart are paper pieced with the NEW Bali Breeze DP, Pretty In Pink and Tempting Turquoise CS. The flower on the heart is punched with the Trio Flower Punch and Tempting Turquoise CS ... Pretty In Pink Brad through the center of the flower ... and adhered with a Stampin' Dimensional. The scallop border was created using the Slit Punch. Note: Card measures 4 1/4" x 8 1/2", scored at 4 1/4"
Today's Featured Stamper on SCS (FS47) is Danielle Lounds, dlounds on SCS. Danielle's gallery is amazing ... I could play all day! Beth posted the challenge last night, and I stayed up late to create this card. I was so excited to load it this morning, but have had non-stop computer problems all day. So frustrating! We'll see if I'm finally able to post this time. I chose THIS CARD of Danielle's to case. The only things I changed were the colors, designer paper, and added some non-SU Diamond Stickles to the butterflies. The butterflies are stamped in Groovy Guava on the Very Vanilla CS, then stamped again on another piece of Very Vanilla CS, cut out, and mounted with Stampin' Dimensionals. BTW, check out Danielle's blog, Fat Cat Stamper. I received this cute cute cute Christmas Card from Wendy Bond, joelysmom on SCS. Just a quick post today ... technically, I'm still on "vacation" but it's really really hard to stay away! I have plans to do some MAJOR stamping over the next few days ... can't WAIT! John and I are going out to dinner with some friends tonight .... an actual adult night out! My Mom's birthday is on Christmas Day. I know, you're probably gasping at the thought ... BUT Mom has never really minded it much. When she was a kid, there was no money so the "getting jipped in the gift area" was not an issue, and many people remember her birthday because it's on Christmas Day! It's unique, that's for sure! This is the card I mailed to my Mom for her birthday. I always try to give her a traditional birthday card ... not a Christmas card. It is a CASE of THIS CARD by Cici510 on SCS. The flower center is an over-sized self-adhesive rhinestone I found in the wedding section of my local Michael's store. My brother and his family have been visiting from Iowa since Sunday, and left this morning .... so this is the first chance I've had to post the wonderful Christmas RAKs I've received this week. I'm having major stamping and blogging withdrawal .... I'm really hoping to get some time this weekend for both! Imagine my surprise when I received this package in the mail from my friend, Fran Sabad (FRANTICSTAMPERS). Fran sent all sorts of goodies in this Winter Bright SSK Treat Box ... tutorial on SCS by Beate Johns found HERE. ... AND this ribbon key chain using Stampin' Up! ribbons. It is similar to the key chains SU Demonstrators were able to purchase at Convention last summer. To see more of these wonderful key chains on Fran's blog, click HERE. These key chains are pure genius, and Fran promises to be working on a tutorial! The card attached to the key chain has a flap that opens with a greeting and Fran's handwritten note. The stamps used for this card are from Perfect Presentation. Notice the Jumbo Eyelet too! The next card is a Season of Joy Christmas card I received from my upline, Barbara Welch, Creative Stampin' Spot. For the recipe to make this card, click HERE. This next festive card is from Amy Goldenetz, amyGdesigns. This cute Frosty card is from Corie Foster, Creations by Corie. Today, I received this cute Merry & Bright thank you card from my friend, Sandy Braddock, doublesmom on SCS. Look at this FABULOUS Christmas gift I received from my dear friend and SU Sideline, Lorri Heiling, (Confessions of a Stamping Addict)! Lorri is continually coming up with unique and original stamping ideas! What fun it was to open this gorgeous gift! It is a set of four coasters. Lorri said the coasters were intended for photographs, but she altered them with Stampin' Up! Apple Cider DP, stamps, ribbon, etc. Look at the cool coaster holder --- I love the colored stones she added! Such a clever gift! This photo shows how Lorri altered the four coasters. This is Lorri's family Christmas card. I think this is one of the neatest Christmas cards I've seen ... very personal ... it's like a scrapbook page Christmas Card! For more details on this beauty, visit Lorri's blog, Confessions of A Stamping Addict. The photo is of Lorri and Dan's three children. Please keep their family in your prayers, as their oldest son, Brook (left in photo) is an Air Force pilot and is being deployed overseas next week. MORE RAKS ... LUCKY ME !!! Still "vacationing from blogging" but had to stop in to share some more hand stamped goodies from some of my dear stamping friends ... lucky me! My friend and fellow band mom, Karen Laub (nikesmom on SCS) stopped by the other day with a Christmas gift wrapped in this adorable handmade gift bag! We had made one of these altered brown paper bag sacks at a class for Mother's Day, and Karen created this beauty for me for Christmas! This festive Christmas card arrived today from Allison Fillo, Stampin' When I Can. I love the idea of the gold cording wrapped around the fold of the card, and the gold beads threaded through! Gorgeous, Allison! BTW, Allison's offering some great blog candy right now .. check it out! My friend and fellow band mom, Sandy Braddock (doublesmom on SCS) sent this adorable thank you card to me. MY FAVORITE PART OF CHRISTMAS .... MAIL !!!! Yep, the walk down the street to the mailbox is the highlight of my days in December! I love receiving Christmas cards, letters and photos of family and friends! My absolute favorite mail? ... hand stamped cards, of course! Here are some of the neat creations I've received this week. This first card is hand stamped by my friend, neighbor and SU Downline, Tammy Mendoza. Tammy's cute and festive card uses the stamp set, Big on Christmas, and Dashing DP. This next beauty is from Tammy's sister, my friend, and SU Downline, Michelle Anaya. This card just sparkles with bling! Beautiful! My friend, Leslie McGahie sent this next card to me. I just love the way Leslie combined the twill and grosgrain ribbon, and there's lots of sparkles on the ornament images! Just gorgeous!!! My friend Linda Wiest sent this next festive card to me! Linda came to me right after Thanksgiving with this design already in her mind and sketched out. 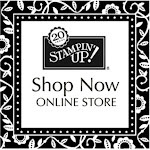 We worked together to tweak the design and order the Stampin' Up! Dashing DP, cardstock, and ribbon. She assembled 100 of these cards for her family and friends ... no small task! My friend and SU Sideline, Lorri Heiling, mailed this card to our family last week acknowledging John's Uncle's passing. Lorri is so very sweet ... always thinking of others! Her combination of Kraft and Chocolate Chip CS is gorgeous! I love how she used the White Gel Pen to accent the Bud Basics images! To see more of Lorri's creations, visit her blog: Confessions of a Stamping Addict. My friend, Sandy Braddock delivered this next Christmas goodie to me yesterday. The kitchen towel, "Old Olive Spatula", and frame ornament are from one of my favorite stores, Crate & Barrel! I wanted to show you how she incorporated her stamping skills in this gift. She stamped the image from Season of Joy on CS and created a tag with slots that tied around the gifts with grosgrain ribbon. So creative, and a lovely presentation! MY FIRST TIME ON STAMPER'S SHOWCASE! OK ... I said I'd be breaking from blogging for two weeks ... and I really really am ... but when something like this happens, you just gotta share! One of my cards made it to Stamper's Showcase today --- my first time! woohoo!!!! In case you don't know what Stamper's Showcase is, it is an art gallery on the Stampin' Up! Demonstrator website. Stampin' Up! selects a handful of cards to post in the gallery each day. This is the card that made Stamper's Showcase today ... you can see all the details and recipe for this card HERE. It's been quite a week here at the Riley house. John's Uncle Howard passed away on Tuesday and the funeral was held on Thursday. Please hold Howard's wife, Shirley, and their three children in your prayers. My Mom had emergency surgery on Tuesday and is doing well now. We are praying this will be the end of her streak of health issues. I am staying on task preparing for the Christmas holiday and my company. My brother and his family are coming from Iowa to stay with us for five days. They haven't been to Arizona for a visit in 7 years, so this trip is much anticipated! I will be taking a two week blogging break so I can prepare my home, food, Christmas, etc. then enjoy their company while they're here (unless, of course, I find some free time to participate in a SCS challenge!). It'll be difficult to stay away from stamping, but am looking forward to getting things in order and having things "just so" for their visit! If ... if ... if I don't post again before Christmas, please know that I wish each and every one of my readers a joyous holiday! I am so grateful for all the connections and friendships I've made this year through blogging. THANK YOU for checking in each day, THANK YOU for your kind comments and words of encouragement, and THANK YOU even to those of you who read and don't leave comments! I know you're there, because my counter keeps going up and up to unbeliveable numbers! Most of all, remember the Reason for the Season; the birth of our Savior, Jesus Christ. See you in 2008, if not before! Remember the altered Junior Legal Pads and tutorial in THIS POST using Dashing DP? I made several more using Wintergreen DP. I found the Wintergreen DP a little more difficult to coordinate two different patterns than the Dashing DP, so in some cases I chose to use Certainly Celery Prints DP. I made 15 of these notepads and gift pails as teacher gifts and friends' gifts. I purchased the white snowflake pails at the Target $1 Spot, and used my Crop-A-Dile to punch two holes in the front of the pail for the ribbon/cord to loop through. I tried to find items that coordinated with the Wintergreen DP (not an easy task!). Some things I did come up with: CO Bigelow Spearmint and Mint Lip Glosses from Bath & Body Works (a perfect match! ), Candy Canes, and candies wrapped in silver wrappings. MERRY CHRISTMAS my friends !!!! ANOTHER HAPPY MAIL DAY !!!! Yesterday was another exciting mail day that brought this beauty from Nancy Morgan, Paper Smiles! The mirrored gold cardstock paired with River Rock DP and Always Artichoke CS is a fabulous combination for this stamped image from Sidekick Sayings (Level One Hostess)! 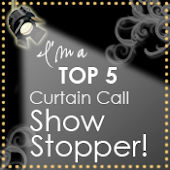 Love all the gold brads, ribbon, paper piercing, photo corners, ticket corner punch, and gold Stickles! I got myself a little package in the mail too! Looks like I've been ELF'ed TWICE! This fun package is from Dawn Easton, Treasure Oiler Designz. Dawn's card uses one of my FAVORITE color combinations this Christmas -- Wild Wasabi and Pretty In Pink! The main image is from the stamp set, Flaky Friends. The white snowflakes on the cards are brads, and she even dry embossed with the Crop-a-dile underneath the main image. Dawn's package also included some festive ribbons, an ornament, a flashing charm, and Hershey's Candy Cane Kisses (I think I've eaten half the bag already!). Gosh, what did I ever do before blogging? As a result of blogging, I have received so many great handmade cards and items in the mail, and have developed so many cherished friendships! THANK YOU Nancy and Dawn !!!! The invitations for the law firm (PREVIOUS POST) are completed and delivered !!! WOOHOO !!! A HUGE thanks to all of you who left comments and e-mails to solve my envelope dilemma!!!! (The dilemma was to find an attractive, mailable solution for these 3 1/2" x 3 1/2" Triangle Tri-Fold Invitations). I knew I could count on my creative readers to help me out with this one ... all the ideas were great! Ultimately, MAGGI's suggestion is the one that suited my needs for this invitation the best. Thanks, Maggi!!!! This is what I did: I took 1" x 4 1/4" Basic Black CS strips, rounded one corner, added Sticky Strip to each side, and adhered inside at each end of the rectangular 5 3/4" x 4 3/8" envelope. The strips of CS act as spacers so the invitation doesn't float around the envelope. I found this to be the fastest and most attractive solution. A few weeks ago, I was hired by a local law firm to create invitations for their 10th Anniversary Celebration Dinner. The event will be semi-formal at a pricey restaurant located at a high-end Scottsdale resort. This was probably one of the most challenging projects I've ever tackled. Trying to make formal, elegant invitations without making them look like wedding invites was difficult! I gave them several samples to choose from, but ultimately, they chose this first sample; a triangle tri-fold card inspired by stampinbrenda on SCS. See stampinbrenda's original HERE. I'm in the midst of putting the finishing touches on these invites so I can deliver them within the next couple of days. I have a dilemma that I was hoping my crafty, creative readers could help me with ... the envelopes for these 3 1/2" x 3 1/2" tri-fold cards. These will be mailed, and the United States Postal Services' minimum size requirements for mailing a square envelope is 5" x 5", and minimum size requirements for mailing a rectangular envelope is 3 1/2" x 5". I could put these invites in a larger envelope, but I'm thinking that is going to look unprofessional. Any ideas for an attractive, professional-looking envelope/mailing option? If you have any ideas, PLEASE leave a comment! Tutorial for Triangle Tri-Fold Card by Beate Johns. This next card is a CASE of Nancy Morgan's original found HERE and HERE. The only things I did differently from Nancy's original is flipped the card and used self-adhesive rhinestones in place of brads. Note: Card measures 5 1/4" x 5 1/4"
This next card is a case of THIS CARD by newmomat39 on SCS. The only things I changed were the sentiment, and added a silver Stickle to the (for lack of a better word) "tulip bud". I'm posting this at the risk of showing you my sick and twisted Stampin' Up! mind ! Yep, I'll admit it ... my mind works in Stampin' Up! 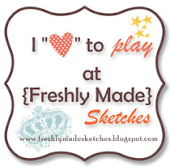 stamp set designs and Stampin' Up! 48 colors + 6 In Colors, and you'll see that it doesn't take much to make me happy! When you look at this bucket, what Stampin' Up! stamp set do you see? Do you see what I see? .... the Stampin' Up! stamp set Merry & Bright! See how the tree image is very similar to the one in the Merry & Bright stamp set? Do you also see Old Olive and Real Red? How convenient for me that I found these little buckets at the Walgreen's on the corner! It just so happened that I had ordered a few Merry & Bright stamp sets for a few stampin' friends for their December birthdays, and had these Merry & Bright Wish Lists already made up with Dashing DP (in the colors of Old Olive and Real Red). I also included some coordinating Real Red/Old Olive 5/8" Grosgrain Ribbon, chocolate and red shred. I just dressed up the bucket by adding the snowman image in the scallop medallion with ribbon. I was so excited to give these to my stampin' friends! Note: Bear with me here readers ... I'm in Christmas mass assembly mode and obviously desperate for anything new and remotely interesting to post! When I was a little girl, I was thrilled to receive greeting cards and handwritten letters in the mail. I remember receiving handwritten letters from my Aunt Diana, and handwritten postcards from my Mom while I was away at bible camp (for a whole week!). It is just as thrilling in my adult life to receive a greeting card, handwritten letter, and better yet ... a hand stamped card! Yesterday, I received this happy card from Cyndi Bundy. 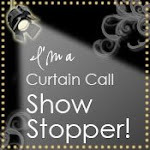 Please visit Cyndi's blog, The Scrappy Chick ... it is filled with inspiring ideas! Cyndi used the stamp set, Time Well Spent. 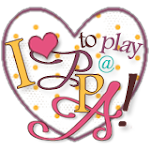 Another perk of being a Stampin' Up! Demonstrator .... all demos received this stamp set a few weeks ago FREE as a gift from Stampin' Up! This stamp set will appear in the new Spring Summer 2008 Catalog & Idea Book as a Level Three Hostess Set. I am one spoiled girl, I tell ya'! Look what my ELF on SCS, Jackie Pedro, sent to me! Jackie is a new blogger with oodles and oodles of talent! 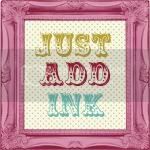 You've GOT to check out her blog, The Scalloped Edge, and her SCS Gallery (strappystamper) !!! Click HERE for all the details about Jackie's CUTE card she sent to me using Punch Pals! I just had to take a photo of Jackie's gifts all packaged together with ribbon that coordinates with her card and nugget tin. The photo below shows all the goodies ... two bottles of Stickles, Making Memories Pebble Brads, and the adorable nugget tin that matches her card! Oh, I love it all! THANK YOU, JACKIE!!!! * The notepad itself is a Junior Legal Pad purchased at my local office supply store (Staples or OfficeMax). They have a copy center, and all you do is ask them to cut the pads in half vertically. My office supply store charged me $1.00 to cut the entire package of pads. Note: In my examples, there is paper piercing along the Old Olive horizontal CS strip above and below the Real Red horizontal CS strip, and on each scallop of the scallop circle. Stamp the snowflake image from Merry & Bright on random pages of the notepad. I did use Pumpkin Pie marker to color in the snowman's nose, and Blush Blossom marker to give the snowman rosy cheeks. *Cut Real Red CS base 5 1/2" x 8 1/4", score at 2 5/8" and 2 7/8". * The outside DP panel measures 2 1/2" x 8", then cut at 5" and flipped with the opposite side of the DP on the bottom. * The inside DP panel measures 2 1/2" x 8". * The flap that goes around the top of the legal pad measures 1 7/8" x 2 1/2", and scored at 7/8" and 1". * I used Sticky Strip to adhere the notepad to the cardstock. Here are some more coordinating goodies that I sent to Nancy and Fran; an altered jumbo paper clip and altered Hershey's miniatures. This next photo is of the completed buckets of elfing goodies with plenty of chocolate and a few stamping necessities. I've had these tins for quite sometime (thanks Leah! ), and used Sticky Strip to attach the Old Olive 5/8" Grosgrain Ribbon to it. The bow is separate and adhered with Glue Dots. The hanging pendant is the same image used on the notepads, and hung from the bow with Silver Elastic Cord. Thanks for looking! I'm slowly getting over my annual "Christmas Freak Out"! I've been completely overwhelmed with to do's in my head the last few days, but am feeling better after getting the house decorated today! woohoo! One more thing to check off the list! As Joanne Basile told me last night, and Lorri Heiling told me this morning, "BREATHE IN, BREATHE OUT! ".